This is the seventh in a series of research guides to Irish Catholic churches in Quebec posted on Genealogy Ensemble over the past several months. This guide is designed to help you find the churches where Irish Catholics were baptized, married and buried in the region that is between the St. Lawrence River and the border of Maine. When tens of thousands of Irish immigrants flooded into Lower Canada (Quebec) in the 19th century, they settled on farms and in cities everywhere. Most of them were Catholic; Irish Protestant immigrants usually settled in Upper Canada and other English-speaking regions of North America. Please note: The term Irish Catholic churches does not imply within this research guide that parishioners were mostly of Irish descent. I mean that, at one point in time, a minimum of 10% of the acts of baptism, marriage and death addressed Irish immigrants or their descendants. The earliest church record I was able to trace in regard to the Irish in this region was in 1794 in the parish of Saint-Joseph, in what was then the village of Lévis. Within this research guide, I have addressed the parishes situated in all of these former counties, with the exception of L’Islet and Montmagny. I will address them in a future compilation on Irish parishes of the Lower St. Lawrence. In the counties of L’Islet and Montmagny, the Scottish Catholic presence might have been greater than the Irish Catholic presence during the 18th and 19th centuries. The Irish, Scottish and French Catholic families in this region lived in harmony during the 19th century. However, the few Irish Protestant families from Northern Ireland who settled in this region had difficult moments with the Irish, Scottish and French families of the Catholic faith, so some of them moved to Mégantic County during this period. The county of Bellechasse was created between 1829 to 1838 by the British authorities from a former seigneury of the same name that existed under the French regime. Dorchester County, next to Bellechasse, was created by the British between 1792 and 1829. Some of the villages and churches of these neighbouring counties are sometimes found with two names. For example, Sainte-Claire-de-Bellechase and Sainte-Claire-de-Dorchester are the same parish in the village of Sainte-Claire de Bellechasse. 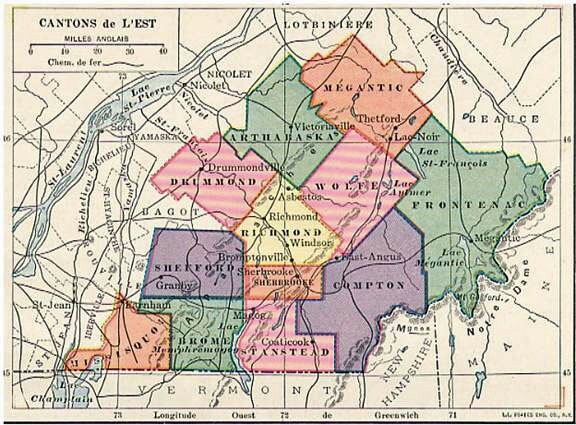 Other villages and parishes are similarly named Dorchester and/or Bellechasse. Similar situations can be found in Dorchester and Lotbinière counties. The villages and churches did not move, the boundaries changed in the 19th century. See the listing of towns, villages, cities within Chaudière-Appalaches. The PDF research guide linked below includes a list of Catholic parishes in the region, links to the region’s cemeteries, a list of recommended reading and links to archives and online resources that could be useful to researchers.